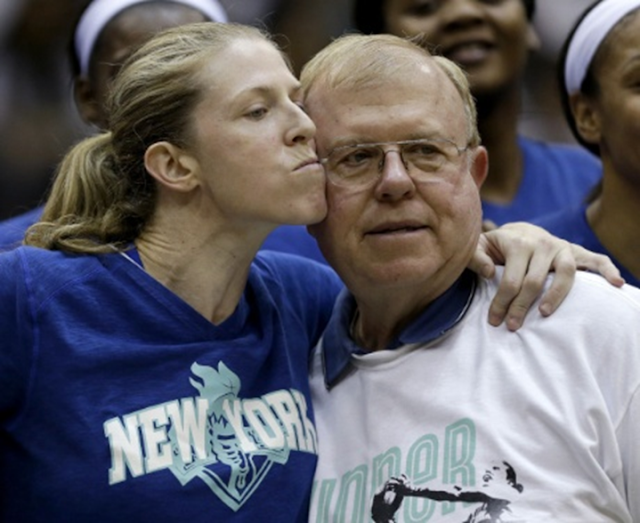 Katie Smith hugs her father, John, during a ceremony honoring her before her final home game with the New York Liberty. She retired as the career scoring leader in women’s pro basketball. The New York Liberty paid tribute to Katie Smith on the occasion of the final home game of her WNBA career. This was two weeks ago, at the Prudential Center in Newark, N.J. Odd choice of words? Or, perfect? “I’m sorry to have to publicly do this, but it’s my job.” That is how Smith played her whole career, and became one of the most highly decorated athletes of her generation, male or female. That is how she barely caused a ripple in the national media when she tiptoed away earlier this month. Excuse me, thank you and have a nice day. Smith did a good job in the way Oscar Robertson did a good job. She was the national high-school player of the year at Logan and the Big Ten player of the year at Ohio State. She won a WNBA scoring title (2001) at a time when Sheryl Swoopes, Tina Thompson and Lisa Leslie were the recognized stars. Ultimately, she retired as the career scoring leader in women’s professional basketball. She made more three-pointers than any other woman. She could guard all five positions and was the most feared defender of her time. And she won. She won two American Basketball League titles in two years with the Columbus Quest before the league folded and two titles in 15 years in the WNBA. She won three Olympic gold medals in a two-decade-long association with the U.S. national team. This was the farewell tour: Smith played her last two WNBA games on the road, at Indiana and Washington, and was acknowledged by the PA announcers and patted on the back by some fans. She smiled and waved and headed back to Columbus. Perfect. Smith marvels at how, when she was a child, she never even thought about playing professional basketball — mostly because the WNBA did not exist. She helped establish the league. She is proud of that. Next dream? Smith is doing some in-studio work for NBA TV during the WNBA playoffs. She is in her third and final year of graduate school at Ohio State, on course for a master’s in dietary science. Although details have yet to be completed, the plan is for her to join Bill Laimbeer’s coaching staff with the Liberty next year. Sooner or later, the Hall of Fame in Springfield, Mass., will call. “People talk about that — Dawn Staley just went in this year — and of course, it would be cool,” Smith said. “Looking back, though, I didn’t play for the Hall or any of that other stuff. The journey has just been surreal, you know? I started playing the game, and I continued to play the game — and it felt like a game. It was fun. Nobody longer, nobody higher, and excuse me for publicly doing this.